The longer their losing streak continues, the more we have to consider everybody as possible Blackhawks trade chips in Chicago. The deeper and deeper the Chicago Blackhawks move into their current losing streak (now at six games and counting), the more and more clear it becomes that the franchise has to consider all options. 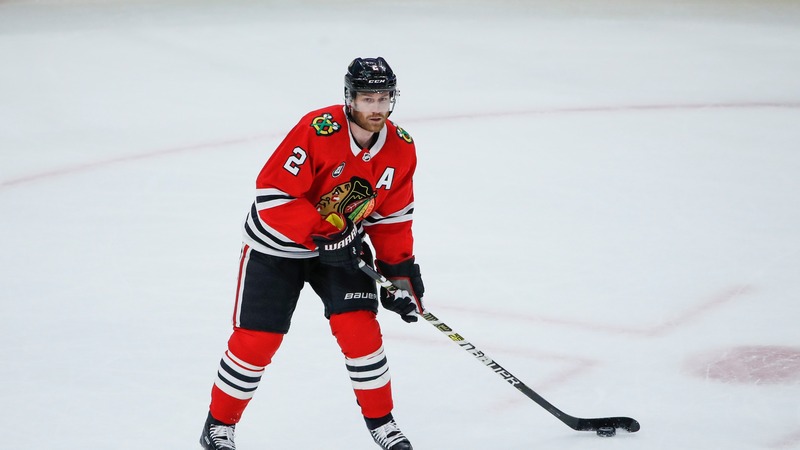 Despite all that players like Duncan Keith and Jonathan Toews have done for Chicago, everybody has to be considered possible Blackhawks trade chips at this point. There are contractual hurdles and certain players who might not be considered desirable by other franchises, but anybody who there is a market for has to be considered as trade bait after a 76-point last-place finish last year and a [9-16-5 start](https://www.betchicago.com/blackhawks-rebuild-imminent-schmaltz-trade) this year. Of course, that means tough decisions are on the horizon. __Play to win:__ [Enter our free contests for chances at great prizes and even cash! ](https://betchicago.chalkline.com/) So let's take a look at who might generate interest and what the Blackhawks might be able to do with them. ## Chicago Blackhawks trade chips ### Unlikely Blackhawks to be traded __Alex DeBrincat:__ Nobody is untouchable, but the fact that DeBrincat is only 20, has already been extremely productive and has two years (counting this season) left on his entry-level contract probably means they wouldn't move him unless they got an absolute haul. Think multiple first-round picks or multiple prospects with actionable top-six potential or better. __Patrick Kane (owns no-move clause):__ Kane is creating offense for himself at a level he never has before, as he's on pace to [set career highs](https://www.betchicago.com/blackhawks-wasting-patrick-kane) in Corsi For, Fenwick For, Scoring Chances For and High-Danger Scoring Chances For. So his $10.5 million cap hit is still justified, though if this is a multi-year rebuilding process you have to consider offers because he could demand a fortune. __Jonathan Toews (owns no-move clause):__ Toews has helped himself this year and his superstar status makes it hard to justify moving him to the fan base, but he hasn't been a $10.5 million player the last few years and if you got a great offer, it has to be weighed seriously. __Brent Seabrook (owns no-move clause):__ Seabrook is a legend, but his contract has turned into a brutal one and it's going to be incredibly difficult to move that deal without the Blackhawks winding up being the ones paying for it. __Henri Jokiharju:__ He doesn't have the season and change of NHL productivity like DeBrincat, but most of the same logic applies. This is the first season of his ELC and he's been good enough to think he has a long-term future here. __Dylan Strome and Brendan Perlini:__ They just got here. ### Players the Blackhawks can hold out for the right trade offer for __Duncan Keith (owns no-move clause):__ Keith's best days are behind him, but he's still a quality defender and his $5.5 million cap hit with an actual cash charge that is lower than that and will keep getting lower the rest of his career makes him [movable. ](https://theathletic.com/701408/2018/12/07/duhatschek-notebook-why-trading-jeff-carter-and-duncan-keith-makes-sense-why-goal-scoring-is-still-up/) For those same reasons, you don't have to pull the trigger this offseason, but it's hard to imagine the Blackhawks can get good fast enough to make use of what Keith has left in the tank. __Brandon Saad:__ The opportunity cost of acquiring Saad (Artemi Panarin) means the franchise would probably like him being a part of their next push but he's only under contract for two more seasons after this, so they'd have to consider a good deal if it is offered. __Corey Crawford (has 10-team trade list):__ Crawford is in the middle of a tough stretch (losses in seven straight starts), but he played some great hockey earlier in the season and his trade value could be repaired rather easily with another stretch of good hockey. The Blackhawks don't have an immediate replacement and he's under contract for another season after this. They can probably get the most for him in the event of an injury a starting goalie on a contending team. ### Blackhawks should trade, but player must agree __Artem Anisimov (owns no-trade clause):__ Anisimov has been good but not great for the Blackhawks and his contract isn't one that they love having around at this point. The question is, who thinks he can produce enough to justify the $4.55 million hit and will they get an offer from a team that Anisimov will accept a trade to? __Marcus Kruger (owns no-trade clause):__ Kruger is a solid defensive center who can kill penalties and there's always value for that. However, he carries a nearly $2.8 million cap hit and has right of refusal on a trade so he can also just play out this season and take his chances in free agency if he wants. __Chris Kunitz (owns no-move clause):__ There's not a lot of gas left in the tank here, with just two points in 21 games, but if the Blackhawks can find somebody willing to take him and Kunitz agrees to a move (think playoff teams), they would take it in a heartbeat. __Cam Ward (owns no-move clause):__ Ward signed with the Blackhawks because he knew he'd get to start early on and thought he might be a oft-used backup on a potential playoff team after. It doesn't look like he'll get the playoff chance anymore, so now his options are to hang around and try to make the most of his playing opportunities or to accept a trade to be a backup elsewhere. ### Blackhawks unprotected trade chips __Erik Gustafsson:__ Gustafsson has provided some offensive juice from the blue line for the Blackhawks, with five goals and seven assists this year. Considering he's only making $1.2 million for this season and next, he might be worth keeping around but there's nothing to stop them from moving him for the right offer. __Andreas Martinsen:__ He's an unrestricted free agent next year, so if there's a market for a fourth-line forward with some size, the Blackhawks would have to make that trade. ### Younger Blackhawks on good contracts __Alexandre Fortin, David Kampf and Dominik Kahun:__ All three of these young forwards are on entry-level contracts and they've shown flashes of talent. Obviously, if a team makes a really good offer, they'll consider it. However, the contractual control and their developmental potential probably makes them players who Chicago won't actively shop. __John Hayden:__ Hayden isn't on an ELC, but he's only making $750,000 for this season and next season. As a bottom-six guy, he can play center and wing and that versatility is probably worth keeping around considering the price point. Again, if somebody wants to get crazy and offer a mid-round pick for him, they'd do that deal but the Blackhawks have the leverage here. ### Known Blackhawks trade chips __Connor Murphy:__ Murphy is about to come off of injured reserve after missing the first two months of the season with a back injury and it's been [reported](https://theathletic.com/701227/2018/12/07/source-blackhawks-shopping-defensemen-to-create-space/) by Scott Powers of The Athletic that Murphy is actively being shopped. The 25-year-old has an attractive skill set but the productivity hasn't always been there. He's under contract through 2021-22 and he carries a $3.85 million cap hit, so that deal could impact his potential trade value. __Jan Rutta and Brandon Manning:__ Both 28-year-old defensemen carry $2.25 million cap hits, though Rutta has one year left on his deal and Manning has two. Both players have been made available (again according to Powers) via trade, with the Blackhawks reportedly willing to accept just about anything to clear the cap space and the roster space with a logjam of defenders.